Chocolate-dipped fruit? Easy pizza? Moon and star cookies? Perfect pancakes? Whip up a feast of yummy snacks with quick, easy-to-make treats that need just a few simple and tasty ingredients. 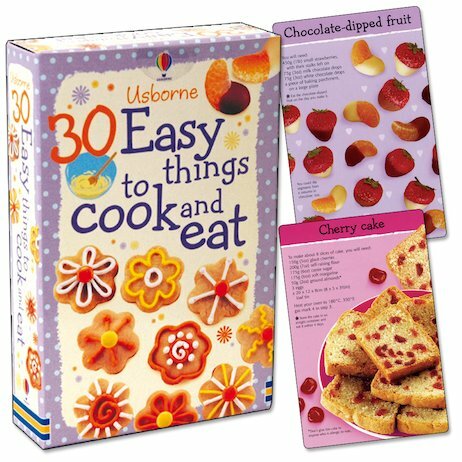 There are recipes to bake, treats to cook up on the hob and even ones you don’t need to heat up at all! With heaps of tasty snacks to take to picnics, parties and barbecues, all you do is pick a card and off you go! I THINK THAT THE RECIPES ARE GREAT BEACAUSE WHEN YOU HAVE NOTHING TO DO YOU CAN COOK SOMETHING FROM THE RECIPES.